To learn more about Invisalign® Teen, please visit the official information page here. 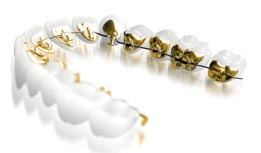 Today, there are metal braces that can be placed on the “tongue side” or lingual of every tooth. Known as lingual braces, these appliances are completely hidden from the outside world. Lingual braces are a great choice for teens and adults who are concerned about wearing braces that are obvious to their friends, families, work colleagues or schoolmates. Musicians who play wind instruments, adult professionals, and people who play contact sports are all ideal candidates. While these braces work in the same way as the metal or ceramic braces affixed to the front of your teeth, they can only be spotted on close inspection during such times as when your mouth is wide open. The process for lingual braces involves taking an impression of the teeth, which is then sent to a dental laboratory and used to create customized brackets. Your choice of brand depends upon the orthodontist and her recommendation, as well as your preference. Some of the most popular brands are: Incognito, iBraces, In-Ovation, STb Light, Suresmile, Lingual QT, Harmony. Because the pressure that moves your teeth into place occurs on the inside of your teeth rather than the outside, training and technical expertise are needed. Your orthodontist must understand the types of movement that will occur and how they may differ from conventional braces. Dr. Lorenzo prides herself in being one of the few local orthodontists certified to treat patients with lingual braces.